There’s something about the summer that invites us to partake in special and spiritually-uplifting rituals centered around food. 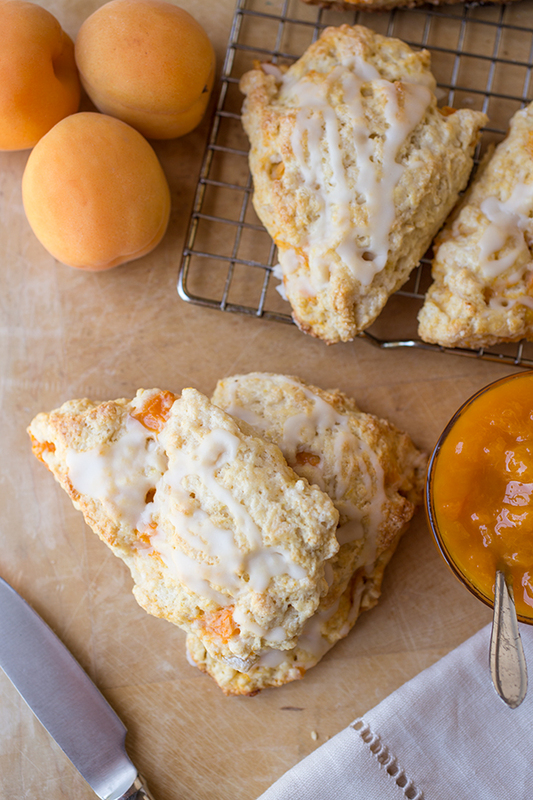 Enjoying these lemon-apricot scones with fresh, homemade apricot jam can be the perfect way to share in the wonderful things the season brings. In the warmth of this season, we love to grab every opportunity we can to enjoy our meals outdoors, to plan get-togethers and to share in the fresh goodies that the season provides. We linger a little longer at the table, chat just a bit more with our loved ones and splurge with a touch more abandon on those tasty morsels that bring our taste buds pleasure and enjoyment. We appreciate being able to squeeze every little drop out of this juicy and warmly spirited time of year, and we seem to do it with more laughter, joy and enthusiasm than usual. We take a few more breaks to enjoy the weather and the sunshine outdoors; we bite into a few more pieces of fruit, whose juices run down our chins; and we drink a few more glasses of refreshing iced tea in the afternoons to quench our summertime thirsts. We appreciate this time of year for what it represents, this leisurely time bathed in a go-with-the-flow kind of vibe. Things don’t need to be quite as rushed in the summertime somehow; in fact, it seems like some leisurely splurging is even encouraged, in a way. What a fragrant thing that ripe and juicy apricots can be, and what a perfect pick for a scrumptious summer sweet treat to indulge in. 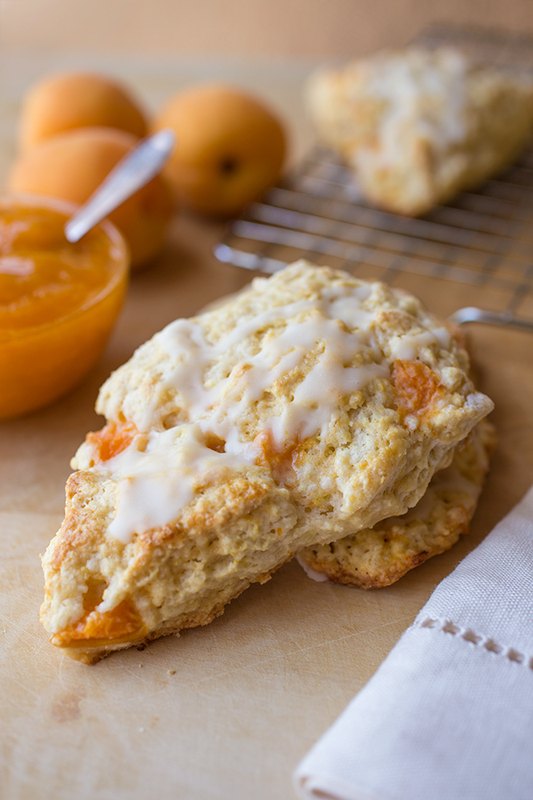 Warm, freshly baked Lemon-Apricot Scones drizzled with a rich, creamy buttermilk glaze are comforting enough on their own, but when slathered in a fresh, homemade Apricot Jam, then the full-flavor of the sweet summer comes deliciously together. 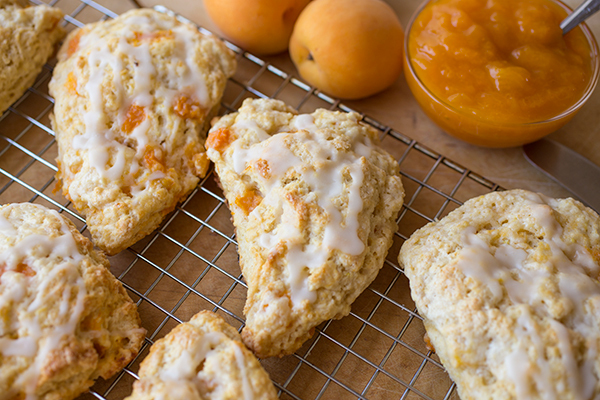 Buttery, aromatic and just slightly tangy from the jam, these summery scones are perfect to enjoy with a cool refreshing drink as a light brunch treat, or as a twist on an “afternoon tea” made just right for the heat of the summer with cold, sun-brewed tropical iced tea. What a perfect pick for a leisurely summer morning, or a break from the heat in the afternoon. So while the summer season is stilling calling out to us to take life at a slightly slower pace and to enjoy all of the fruits of its bright and inviting table, let’s lend an ear and answer the soft and soon-to-be waining call. 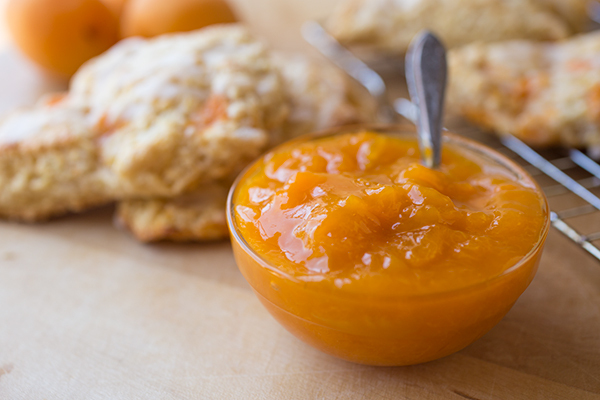 Leisurely moments of pleasurable splurging on the tasty sweets of this time of year will be gone before we know it, so let’s stop and smell the summertime scones, and slather them in all of the apricot jam that we possible can, while the gettin’s still delectably ripe. *Add your cut butter to the freezer about 15-20 minutes before you begin, to keep it extra cold. **I prefer my scones to be a bit more tender and moist, so I use buttermilk instead of cream; however, if you prefer cream, you can just substitute it. ***Place your chopped apricot into the freezer for about 30 minutes before beginning, to make it firm so that it will not crush or smash as easily when incorporated into the batter. -Preheat the oven to 375°, and line a baking sheet with parchment paper. -Add the flour, baking powder, baking soda, sugar, lemon zest and salt to a large bowl, and whisk them together to combine very well; next, add in the cold butter, and using a pastry cutter, forks or even your fingers, work the butter into the flour as quickly as possible (to keep it cold) until it forms little “pea size” lumps and resembles coarse meal. -Next, add the vanilla to the buttermilk, and make a little well in the center of the dry ingredients; add the buttermilk in, along with the diced apricot, and fold all of the ingredients together using a spatula until the dry ingredients become moist and begin to come together to form dough (take care not to over-work the dough); gather the dough together into a ball as best as possible, then place it onto a lightly floured work surface. -Form the dough into a disk shape that is about 1” thick, then cut the disk into 8 equal-sized wedges (cut the disk in half first, then in quarters, then into the 8 pieces) and place those scone wedges onto the parchment-lined baking sheet; brush the tops with a little buttermilk and sprinkle each with a little raw sugar, and bake for about 24-26 minutes, until pale-golden; allow them to cool completely. 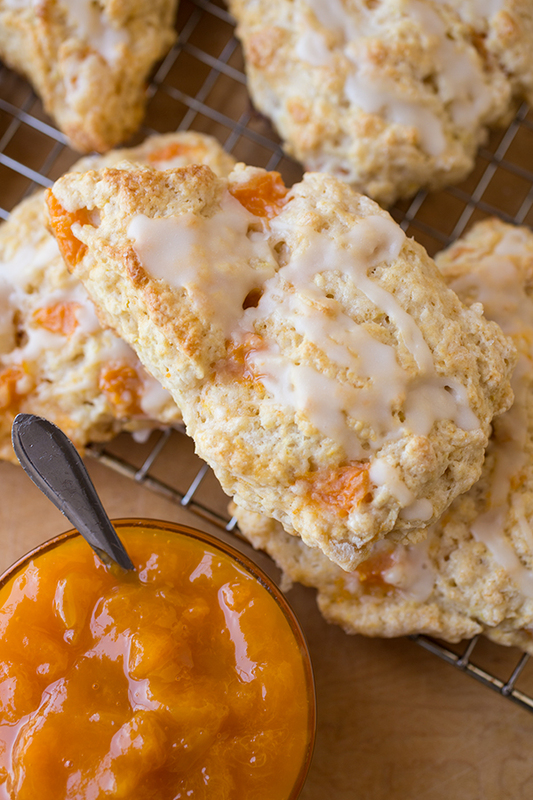 -Once cooled, drizzle over top of them the Buttermilk Glaze and allow it firm up for a few minutes, and then serve the scones with the Homemade Apricot Jam. -Place the powdered sugar into a small bowl, and add in the buttermilk and vanilla; whisk together until well-blended and it becomes a thick yet “drizzle-able” glaze, then cover with plastic and keep in fridge until ready to use. -Place all ingredients into a small/medium size sauce pan or pot, stir to incorporate sugar, and place the mixture over medium-high heat; bring the mixture to the simmer, and allow it to simmer quite vigorously, stirring occasionally to help break up the fruit and release the natural pectins, for about 12-14 minutes, until thickened and glossy; allow the jam to cool completely before serving (it will continue to thicken as it cools), and store in a covered container in the fridge. These sound really delicious. Thank you. They were so delicious! 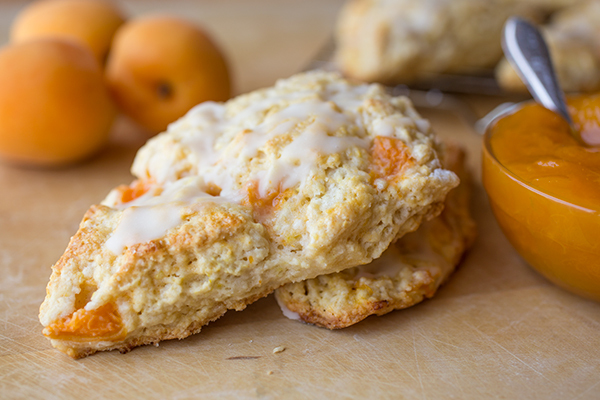 I love apricots and they are my favorite scones. I used dried apricots and put lots of extra. It came out great. Baz, so happy to read that! Very glad you lot enjoyed! And the dried apricots are a great substitution; the more the better!